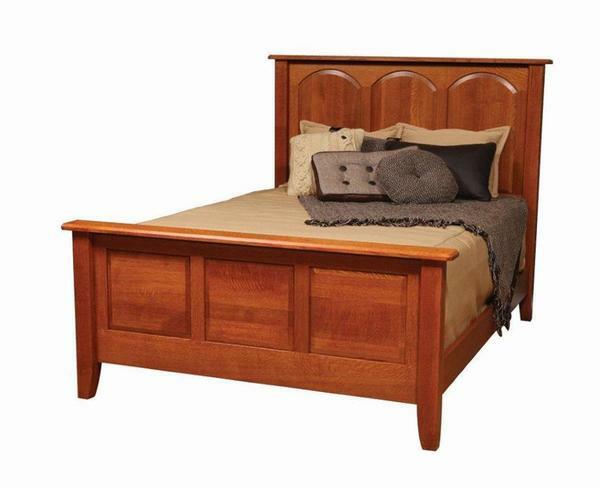 A true, antique-inspired classic, our College Hill Bed offers a quaint, versatile style that will fit into the center of any bedroom ensemble. Taking cues from the timeless Shaker style and matching them to an easy Mission look brings this bed to life. Crafted with raised panels throughout the head and foot boards, accented with thick, square legs and a subtle taper/splay at foot provide the perfect balance of elegant and simple. The use of large, flat panels with clean lines throughout also allows the natural beauty of the hardwood to play its part in your decor, adding a touch of natural warmth into the mix. The classic construction of our College Hill Bed uses solid wood side rails running the length of the bed, tied together with a wooden slat support system to provide stability to your mattress and box spring. Once complete, the College Hill Bed is ready for a lifetime of use, with enough natural strength and beauty to serve as a brilliant hand-me-down for future generations to enjoy. With your new College Hill Bed, the details are yours to choose. Start with a variety of sizes, from Twin to California King, to get the ideal size for your suite. From there, a wide variety of wood and stain combinations lay at your fingertips, allowing you to narrow down to the exact tone you're looking for to complement your existing furniture. If you can't find what you're looking for, had questions, or would like to request stain samples or a custom quote, please give us a call. Our furniture specialists are available to help you furnish the bedroom suite that you're envisioning.